May 21, 2015: Barry Cauchon. The VIP tour inspecting the grave locations for the Lincoln conspirators and Henry Wirz. Hi all: On May 8-9, 2015 I had the privilege of participating in the commemoration of the 150th anniversary of the start of the Lincoln Conspirator Military Tribunal held at Fort Lesley J. McNair in Washington D.C. May 08 commemorated the first day the military commission met behind closed doors to organize their procedures and May 09 commemorated the first day of the actual trial when the prisoners were brought into the courtroom. The two-day event began on Friday night with a VIP reception at the Fort McNair Officer’s Club hosted by Colonel Michael Henderson. Guests included many military officials, historians, NDU specialists and staff, authors, descendants, benefactors, members of the Surratt House Museum and Surratt Society, several Civil War round table officials and some dear old friends. I was one of four speakers presenting that night. Joining me at the podium were Michael Kauffman, author of American Brutus and In the Footsteps of an Assassin; John Elliott (my research partner) and specialist in the courtroom stories as seen from the spectators’ points of view; and historian Betty Ownsbey (Lewis Powell’s biographer) and author of Alias Paine (2nd edition). Following the presentations on Friday night, the attendees were invited to take tours of the restored courtroom and the exterior grounds where the executions took place in July of 1865. John, Betty and Mike led the tours in the courtroom whereas I toured the execution site and vicinity. Earlier that day, John and I painstakingly laid out the locations of the scaffold, the four conspirators’ graves, Henry Wirz’ (Commandant of Andersonville Prison) grave and John Wilkes Booth’s grave. We also laid out the locations for the penitentiary’s 20′ high east wall, the door from which the prisoners exited the penitentiary to their executions and the Shoe Factory where Alexander Gardner took his famous series of photographs depicting the executions. I am grateful and thankful to the folks at Fort McNair who asked me to lay out the locations of these elements (which had never been done before). I have had the dimensions and calculations in both my head and on paper for several years now and was thrilled to finally get a chance to plot them in situ. When you see them in their actual environment, the entire scale of the event is easier to envision. On Saturday, May 09, there was a public open house with free tours to those who signed up. For fire safety reasons, only about 45 people are allowed to occupy the courtroom at any one time so four sessions were planned. John Elliott and Mike Kauffman split the presentations in the courtroom and I did the walking tours outside. It turned out to be a beautiful day and everyone who attended seemed to really enjoy themselves. I want to thank Leah Rubalcaba (Community Relations Officer) and Rob Joswiak (Public Affairs Specialist) and other members of the Joint Base Myer-Henderson Hall team for pulling this event together. I was excited to be a part of it and look forward to assisting again in the future. To see a great article with photos about this event, go to Dave Taylor’s Boothie Barn blog. The article called A Military Tribunal Observation was written by Kate Ramirez and she did a great job in summarizing the two-day commemoration. Thanks Kate and Dave. Finally, I want to thank my wife, Christine for accompanying me to Washington and sharing her wonderful and never-ending support. I love you dearly. Two significant events occurred on the dates of April 14 & 15. The first occurred in 1865 when Abraham Lincoln was assassinated. The second occurred 47 years later in 1912 when the RMS Titanic struck and iceberg and sank to the bottom of the North Atlantic Ocean. President Abraham Lincoln attended the play “Our American Cousin” at Ford’s Theatre on the night of Friday (Good Friday) April 14, 1865. The war had been over for less than a week and the President truly looked forward to enjoying an evening out. 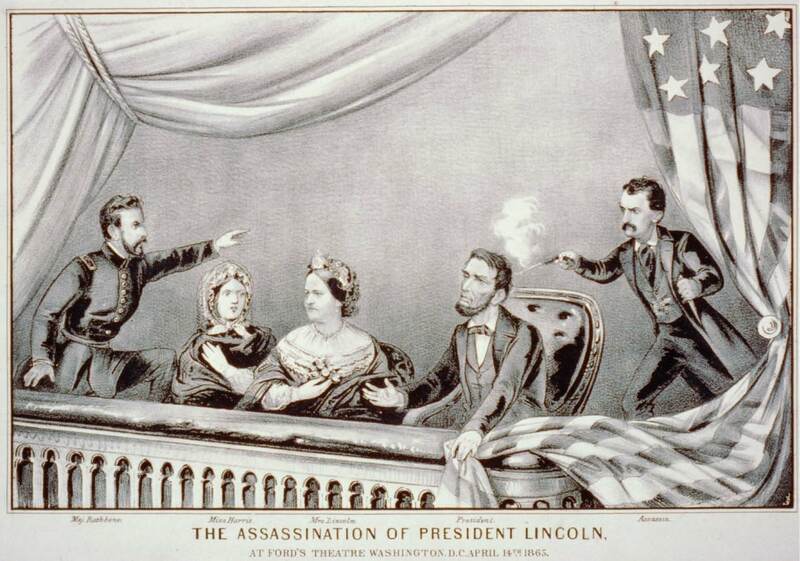 At about 10:15 pm, as the play was underway, John Wilkes Booth slipped into the Presidential box and shot the President. Mortally wounded, Lincoln was carried across the street to the Petersen home where he lived for another few hours. At 7:22 a.m. on Saturday morning, April 15 he succumbed to his injury and died. 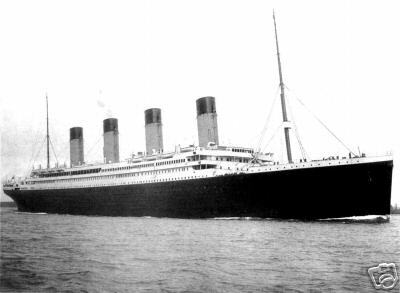 The RMS Titanic, traveling on its maiden voyage from Europe to the United States, struck an iceberg at 11:40 p.m on Sunday, April 14, 1912 and began taking on water. Soon the Captain and crew realized that there was no hope in saving the ship and she would eventually founder. At 2:20 a.m. on Monday, April 15, the ship sank. There were not enough life boats on board to save everyone and 1517 people died in the disaster. Since I was a boy, the dates of April 14 and 15 have stayed with me due to these two tragic events and I make special note of them each year their anniversaries arrive. It was 145 years ago today that four of the eight conspirators tried for the assassination of Abraham Lincoln were marched to the gallows to carry out their sentences of execution. This account is a simplified version of what occurred that day. George Atzerodt, David Herold, Lewis Powell and Mary Surratt (the first woman to be executed by the United States Federal Government) had received the news of their sentences only 24 hours earlier and now, their time had come. Just after 1:00pm, the four condemned were escorted from their cell block into the south yard of the Arsenal Penitentiary where they had been held since early May. Their trial had been conducted in a makeshift courtroom on the third floor of the east wing of the facility. As they emerged from the penitentiary’s heavily fortified door, they were accompanied by twenty-two other people (military officers, soldiers, detectives and clergy). One by one the conspirators were assisted up the thirteen steps of the scaffold and seated. The executioner, Captain Christian Rath, placed Mary Surratt in the chair farthest to the left. He later stated that this was the traditional “place of honor” for a hanging. Next to Mrs. Surratt was Lewis Powell, the man who attempted to assassinate the Secretary of State, William H. Seward on the same night that the President was cut down. Next came David Herold, who accompanied John Wilkes Booth during his 12-day flight after the assassination. Herold gave himself up when he and Booth were cornered in the tobacco barn at the Garrett Farm. Finally, George Atzerodt was seated at the far right side of the scaffold. Atzerodt’s assignment had been to kill Vice President Andrew Johnson, which he never even attempted, but was still convicted for his part in the conspiracy. All four sat quietly while General John F. Hartranft read the Orders of Execution (the death warrant). Upon completing the reading, Lewis Powell’s minister stepped forward and spoke on behalf of Powell, thanking the staff and soldiers who had guarded him for all their kindnesses and then said a prayer for Powell’s soul. Next came David Herold’s minister who did the same. George Atzerodt’s minister spoke last and repeated the process, thanking the staff and then praying for Atzerodt’s soul. The two Catholic priests who accompanied Mary Surratt did not speak publicly and prayed with her quietly during this time. After the last prayer had been said, there was nothing left to do but prepare the four for hanging. They were told to stand and were positioned on the traps that would be knocked out from under them in a few short minutes. Designated officers, detectives and the executioner bound their legs and arms with cloth strips, fitted the nooses around their necks and placed canvas hoods over their heads. As soon as all were prepared, the assistants stepped back off of the traps, leaving only the four condemned standing and waiting. Quickly a signal was given and the traps were sprung. The four dropped. Two seemed to lose consciousness immediately and suffered little if any, while the other two remained conscious and ‘died hard’. Thus brought to a close, the harshest punishments doled out by the military commission assigned to try the conspirators accused in the assassination of President Lincoln. As many of you know, John Elliott (my writing and research partner) and I are preparing an in-depth study on the executions and the events that happened within the walls of the Arsenal Penitentiary. Our book is called “Inside the Walls: The Final Days of the Lincoln Conspirators”. It will be filled with photographs, illustrations, forensic and detailed analysis, architectural drawings, fascinating stories and a full review of the Alexander Gardner execution photographs. We anticipate the book will be ready by the end of 2010. If you wish to receive updated information on the book, please sign up on my update list by writing me at outreach@awesometalks.com and put the word BOOK in the subject line. As well, visit our Facebook page at Inside the Walls (click on the icon at the upper right hand side of this page). 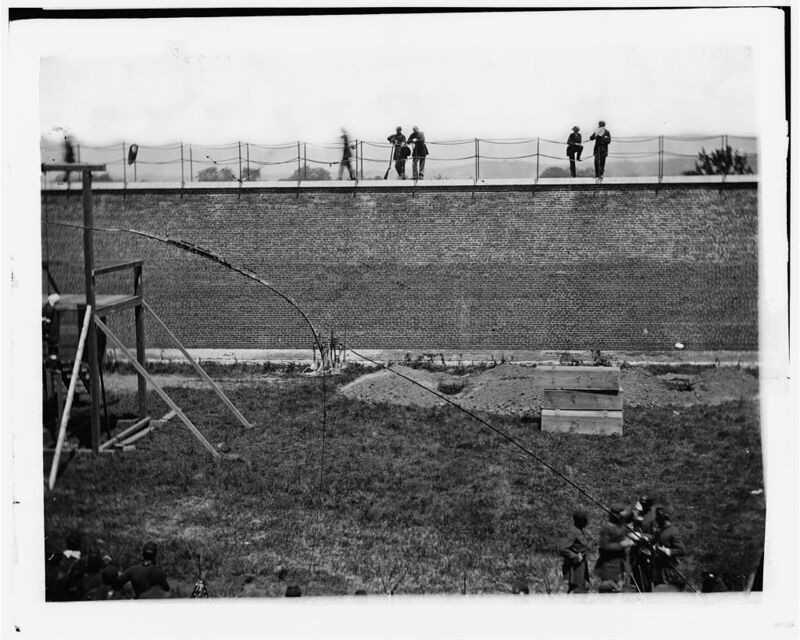 The Lincoln conspirators are prepared for execution at the Washington Arsenal Penitentiary on July 7, 1865. July 7, 2009 will mark the 144th anniversary of the hangings of the Lincoln conspirators at the Washington D.C. Arsenal Penitentiary. Over the past few months, I’ve had the privelege to converse, exchange ideas and share research with my now good friend John Elliott from San Antonio, Texas. John has been working hard at pulling together a history of the Arsenal Penitentiary from before, during and after the period that the trial and executions occurred. Today, the penitentiary no longer exists except for one structure, referred to as Building 20 (or Grant Hall) which is all that remains from the east end of the structure. It was on the third floor of this part of the penitentiary that the conspirators’ trial took place. The land that Building 20 now stands on is located at Fort Lesley McNair, a restricted military installation. Due to the events of 9/11 in 2001 and the security changes that resulted from that event, Fort McNair is no longer open to the public. However, John has gained access on two occasions (all legally I assure you) and not only photographed the site but conversed with several people involved in the current project to restore the building (inclusive of the trial room). It’s a fascinating project and I’ve really enjoyed hearing about the plans they have scheduled for the building. Since most of us will not have an opportunity to see this historical site without military access to the Fort, let me share with you this three-part series that John has compiled starting with Part 1: The Pre-Trial Period (1831-1862). Enjoy. On April 27th, 1865, after being examined and identified as the assassin of Abraham Lincoln, the body of John Wilkes Booth was transferred from the USS Montauk to the Washington Arsenal Penitentiary. Under orders of strict secrecy, his body was buried 10 feet deep in a storage room at the prison. The storage room was located behind an iron door just 5 to 6 feet away from the Warden’s quarters. Booth’s corpse would remain on the arsenal grounds for the next 4 years. Thus began the penitentiary’s storied history and its connection with the Lincoln assassination conspiracy. You shall be industrious and labor diligently in silence. You shall not attempt to escape. You shall not quarrel, converse, laugh, dance, whistle, sing, jump, nor look at nor speak to visitors. You shall not use tobacco. You shall not write or receive letters. You shall respect officers and be clean in person and dress. You shall not destroy or impair property. The D.C. Penitentiary was built during an era of prison reformation. In the early 1800s, society no longer felt that corporal punishment would reform criminals or provide an effective deterrent to crime. Instead, religion, productive work and discipline would be the tools used to accomplish rehabilitation while providing a means to offset the cost of confinement. As a result, Congress allocated funds to construct Washington D.C.’s third prison. Unlike the other two (Old Capital Prison and Alexandria Jailhouse) which were built as temporary holding cells until one could be brought to trial, the new penitentiary would focus on rehabilitating inmates into becoming productive citizens. One person who was committed to seeing the D.C. Penitentiary and all its reform initiatives succeed was the famous humanitarian Dorothea Dix. She donated $100.00 of her own money to the penitentiary library. This was the equivalent of about $2500.00 in today’s (2009) economy. Charles Bulfinch, the architect of the Capital building was selected by President John Quincy Adams to design the new penitentiary. Its location was ideally suited to transport prisoners and supplies by water rather than laboring through city streets. The D.C. Penitentiary was situated just north of the main arsenal buildings on a small peninsula known as Green Leaf Point. Total funds appropriated to build the penitentiary were set at $140,000.00. The original penitentiary consisted of a twenty-foot wall enclosing a three-hundred foot yard and three buildings. The largest of these buildings was a cellblock containing 160 cells. It was flanked on the southwest and southeast corners by two identical buildings which were the administrative offices and the prison hospital, respectively. These three buildings made up the entire prison until the growing number of inmates forced the expansion of facilities. The central building measured 120 by 50 feet, and from outside it appeared to be a three-story building. But actually, the outer walls formed a shell that enclosed an inner cellblock structure. The cells themselves were arranged in four tiers, and each was divided into two ranges of twenty cells each. Charles Bulfinch’s sketch of the penitentiary. Walkways ran lengthwise along both sides of each range and led to stairways at the east and west ends of the cellblock. Each cell measured 7′ by 3 ½′ by 7′ with solid masonry walls eighteen inches thick. Their iron doors opened alternately to the north and south to prevent the prisoners from communicating with each other. Originally, the top tier of cells was to be used for the women inmates, but this plan was soon abandoned. Two ninety foot extensions were added to the east and west ends of the cellblock, and one half of the eastern extension became the new women’s ward. The other half became the deputy warden’s quarters. With the completion of the new extensions, the building measured 300 feet by 50 feet, with two 25 foot sections along the south wall, 120 feet apart. The extreme ends of the building could be entered from outside the penitentiary, and all of the sections were connected by a series of hallways and iron doors. The far west section was considered the main visitor’s entrance to the prison and this is where the warden had his office and living quarters. This section consisted of four rooms on each of its three floors. On the first floor, an iron door led to a large storeroom immediately to the east. This room was also part of the western extension and joined the main cellblock at its east wall. Directly above the storeroom was the prison chapel, and a new prison hospital was established on the third floor of this section. Entering the cellblock’s south hallway from the storeroom, one could pass straight through to the eastern extension. Here another iron door led to the women’s cellblock. This section’s 64 cells were designed and arranged much the same as those of the men’s cellblock, but they were twice as large as the older cells. Adjoining the women’s cellblock was the deputy warden’s quarters, a part of which was originally used for the prison laundry. This was the far eastern section of the penitentiary, and it also consisted of three floors. It differed from its western counterpart only in that it did not have four rooms on its third floor. A T-shaped hallway had been altered on this floor, which left the two northern rooms undivided. Thus, the northern half of the third floor consisted of one large room which measured about 40 feet by 27 feet. Expansion of the prison was completed in the mid-1830s when a wash house and a shoe factory were built on the grounds to occupy the prisoner’s time. For 31 years, the D.C. Penitentiary operated with mostly failed results. The shoe factory built to make the prison self sufficient never made a profit. According to the prison staff, inmates were seen as too lazy and incompetent to properly use the tools they were given. In addition, no continuity in the workshops could be achieved because of inmates being brought in and being released. The average prison sentence for 90 percent of the inmates was less than two years. In an effort to increase the prison population and improve the labor production, the penitentiary opened its doors to non-district prisoners in 1850. It would not be enough. The penitentiary, despite its noble efforts at prison reformation, was soon to be closed. In 1862, citing a need for more storage space for the arsenal, Abraham Lincoln stated that the prison was “absolutely necessary” for military purposes. Lincoln ordered that the prison be turned over to the War Department and that the convicts be transferred to other prisons. Some inmates were sent to Albany, New York State Prison while others were transferred to the front lines. The Arsenal Penitentiary would never again serve as a prison until the spring of 1865. I wanted to let everyone who has been following my blog for the past year know that it has been a very successful venture. One of the most successful postings I produced was the 15-chapter series called The Lincoln Conspirators Execution Photos: A Study in Detail. I have been working on formatting this study into a book version for several months and am glad to report that I have reached the point where I must regrettably remove the content from this blog and begin finalizing the document for print. The final version of this will grow from 15 chapters to about 20-25 chapters as I have lots of other tidbits that I want to add. But to not cut people off entirely from the study, you still have access to Chapters 1 to 5 on line here so you can get a feel for how the overall project was produced. I’m sorry if it is like reading a story and then having to stop right when it’s getting good but regrettably, it is a necessary step I’ve had to take. In the meantime, I am working in conjunction with Mr. John Elliott to bring you a new series on Fort Lesley McNair and the Old Arsenal Penitentiary. John is from San Antonio, Texas and we have been working on some research concerning the Fort and the buildings that are directly connected with the historic hangings which took place in 1865. We’ll report on the anticipated restoration of the 3rd floor room in Building 20 that originally held the trial of the Lincoln conspirators. And perhaps even tell you the story of the mysterious Lady in Black that has appeared in the building for years. US Arsenal in Washington DC with the Old Arsenal Penitentiary (the location of the Lincoln conspirators trial and executions). Map circa 1861. Thank you all for your interest in my blog. I hope this series is as interesting to you as the last one was. For those of you who follow this blog, you’ll know that I have focused much of my research on the events and people involved in the executions of the four condemned Lincoln assassination conspirators. One of the four men who stood below the scaffold to help spring the traps on July 7, 1865 was a soldier named William Coxshall. Alexander Gardner's photograph "Arrival at Scaffold" with William Coxshall standing beneath the gallows on the front left side. Did you know that Coxshall served with Company K, 37th Volunteer Infantry, Wisconsin and during the Battle of Petersburg was wounded, losing part of his left index finger? It’s true. After recuperating from his injury, he was transferred to Company F, 14th Regiment Veterans Corp and assigned to the Old Arsenal Penitentiary in Washington DC. 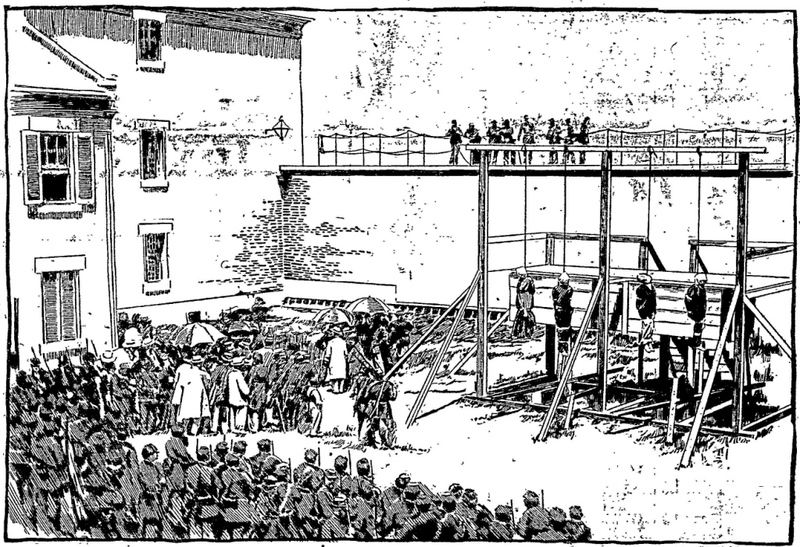 Coxshall was one of four soldiers assigned to spring the traps of the gallows. Alexander Gardner’s photo “Arrival at Scaffold” captured Coxshall’s injury. The Lincoln Memorial built between 1914 and 1922. Washington DC hosts many monuments built in tribute to some of the country’s greatest leaders. The Lincoln Memorial is one such structure. The National Park Service administers the memorial and I have reprinted the brief history they post on their website at http://www.nps.gov/history/Nr/travel/wash/dc71.htm. Once you have read this, scroll down to see some images of approved conceptual drawings, photographs of the memorial and surrounding grounds under construction and the May 30, 1922 Dedication Ceremonies. Enjoy. The Lincoln Memorial stands at the west end of the National Mall as a neoclassical monument to the 16th President. The memorial, designed by Henry Bacon, after ancient Greek temples, stands 190 feet long, 119 feet wide, and almost 100 feet high. It is surrounded by a peristyle of 38 fluted Doric columns, one for each of the thirty six states in the Union at the time of Lincoln’s death, and two columns in-antis at the entrance behind the colonnade. The north and south side chambers contain carved inscriptions of Lincoln’s Second Inaugural Address and his Gettysburg Address. Lying between the north and south chambers is the central hall containing the solitary figure of Lincoln sitting in contemplation. The statue was carved in four years by the Piccirilli brothers under the supervision of the sculptor, Daniel Chester French. The statue of Lincoln is 19 feet high and weighs 175 tons. The original plan was for the statue to be only ten feet high, but this was changed so that the figure of Lincoln would not be dwarfed by the size of the chamber. A commission to plan a monument was first proposed in 1867, shortly after Lincoln’s death. The design for that plan called for six equestrian and 31 pedestrian statues of colossal size, with a 12-foot statue of Lincoln in the center. That project was never started for lack of funds. Congress approved the bill to construct this memorial in 1910. Construction began in 1914, and the memorial was opened to the public in 1922. The Memorial is visited by millions of visitors each year and is the site of many large public gatherings and protests. Martin Luther King, Jr. delivered his famous “I Have a Dream” speech to a crowd by the Lincoln Memorial in 1963 . Damaged over the years by heavy visitation and environmental factors, the Lincoln Memorial is currently undergoing a major restoration. On February 12, 1914 the Ground Breaking Ceremony took place. Within a year of that event, the foundation and base structure were quickly taking form. The foundation construction moving along in January, 1915. Another view of the foundation construction from January 1915. One year after the Ground Breaking ceremonies, the foundation was ready to receive the first cornerstone of the memorial. It was laid in place on Lincoln’s birthday February 12, 1915. Laying the cornerstone for the Lincoln Memorial on Lincoln's birthday, February 12, 1915. The next step was to build the cella (inner chamber of the memorial). This began to take shape by early 1916. It still did not have its now recognizable marble colonnade surrounding it. By late 1916-17 the Doric colonnade and outer structure began to appear. When completed, the final size of the Memorial would be 201 feet 10 inches wide x 132 feet deep x 79 feet 10 inches high above the foundation. The colonnade and roof structure being constructed (c1916-17). The Washington Monument can be seen at lower left. Thirty-six fluted columns (each representing a state in the Union at the time of Lincoln’s death) plus two at the entrance each measure 7 feet 5 inches in diameter. The height of each column from floor to ceiling is 44 feet. Each column has 20 flutes. The foundation of the Lincoln Memorial carries an estimated weight of about 38,000 tons of granite and marble. The colonnade and frieze are being worked on in this photo. The large cranes have now been removed as the roof is now completed. Work on the outer structure still continues. The main cranes which towered over the structure were removed once the roof was completed. The carvings on the exterior of the Lincoln Memorial were done by Washington D.C. sculptor, Ernest C. Bairstow. These carvings included eagles, festoons, wreathes and the states. A close up of a carving on the frieze by architectural sculptor Ernest C. Bairstow. Where Henry Bacon was the architect who designed the Lincoln Memorial, several sculptors and artists were responsible for the statues and carvings found throughout the building. Ernest C. Bairstow was a Washington D.C. architectural sculptor who was brought on to do the exterior carvings which included eagles, states, festoons and wreathes. He also did the carved letters on the interior. Daniel Chester French from Massachusetts was the sculptor who designed the 19 foot seated statue of Abraham Lincoln inside the Memorial. He, along with the Piccirilli Brother studio from Brooklyn, NY created the Lincoln statue from 28 blocks of white Georgia marble. The Piccirilli family and Daniel Chester French work on the assembly of the Lincoln statue. Royal Cotissoz was the New York Herald Tribune art critic who wrote the copy carved behind and above the Lincoln statue. The words read “In this temple, as in the hearts of the people for whom he saved the Union, the memory of Abraham Lincoln is enshrined forever.” The carving of the words for this, and the Gettysburg Address and Second Inaugural Address on the flanking walls were carved by Ernest C. Bairstow. Evelyn Beatrice Longman was a student of Daniel Chester French and was responsible for the interior decorative carvings surrounding the Gettysburg Address and Second Inaugural Address. Two large canvas murals grace the walls of the interior. The themes are Emancipation and Unity. These were done by Jules Guerin. Each are 60 feet long x 12 feet high and weight about 600 lbs. The completed statue of Lincoln (c1943) with Mr. Royal Cotissoz's inscription above. The inscription was carved by Ernest C. Bairstow. The grounds of the Lincoln Memorial slowly took shape. The Reflecting Pool does not exist as of yet. Construction on the marshlands dedicated for the Lincoln Memorial slowly take shape. The Reflecting Pool doesn't exist at this point and the area is used to hold materials and construction sheds. Work well underway on the steps and surrounding exterior elements on the site. The steps lead down to the Reflecting Pool which currently hasn't been built yet. The Dedication Ceremonies for the Lincoln Memorial were held on Tuesday, May 30, 1922. To begin, Dr. Robert Moton presented the keynote address. Dr. Moton was the second president of Tuskegee Institute in Alabama who had succeeded Booker T. Washington as president of the institute. Chief Justice William Howard Taft officially turned over the memorial to President Warren Harding who received it on behalf of the people of the United States. President Harding then spoke to the crowd. To conclude the ceremonies, Poet Edwin Markham read a revised version of his poem “Lincoln the Man of the People” . Robert Lincoln, who did not speak on this occasion, was a special guest and received a loud ovation from the crowd upon his arrival. In attendance, but also not presenting were Vice President Calvin Coolidge (who would later become the 30th President of the United States), and Alice Roosevelt Longworth (Theodore Roosevelt’s eldest daughter). The crowd gathered for the Lincoln Memorial Dedication Ceremonies on May 30, 1922. Special guest Robert Lincoln (Abraham Lincoln's eldest son) arrives at the Dedication Ceremonies. The crowd gave him a loud ovation. Chief Justice (and former President) William H. Taft, President Warren Harding and Robert Todd Lincoln. Robert Lincoln took an active interest in the Lincoln Memorial while under construction. He often had his driver pass by to view it. On at least one occasion he obtained permission to enter the building during construction. A view of the proceedings from the side of the Reflecting Pool. Chief Justice Taft officially turns over the Lincoln Memorial to President Warren Harding who receives it on behalf of the people of the United States. Robert Lincoln looks on (seated lower left). 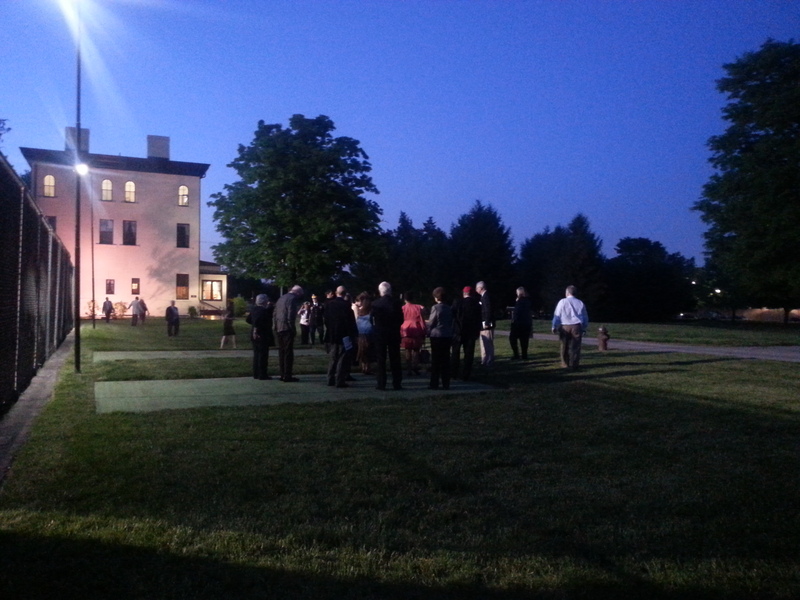 President Harding overlooks the crowd surrounding the Reflecting Pool. The presenters are dwarfed by the Lincoln Memorial's massive marble columns. Poet Edwin Markham reads a verse from his revised poem "Lincoln the Man of the People" to conclude the Dedication Ceremonies. Behind him sits Vice President Calvin Coolidge, President Warren Harding and Chief Justice William Howard Taft. Alice Roosevelt Longworth (daughter of Teddy Roosevelt)(right) departs at the conclusion of the ceremonies. WHAT IS THE LAST KNOWN PICTURE OF ABRAHAM LINCOLN ALIVE? Which of these pictures do you believe is the last one ever taken of Abraham Lincoln while he was alive? Recently I’ve received quite a number of inquiries from students wanting to know the true answer to that question. The volume of inquiries makes me believe that a wonderful teacher somewhere has given an assignment to his/her class on this subject. If so, it’s a good exercise because there is so much conflicting information on this topic that I wanted to be sure myself before commenting. So the first thing I did when faced with this ‘puzzle’ was to investigate the subject from all angles. First I took what I knew about the subject and mixed that with what I could find in books, on the Internet, from the personal opinions from peers and finally, comments from the experts. I try very hard to only publish information that is verifiably true in an attempt to keep the historical record straight. With the advent of the Internet and self-publishing, it is astonishing to see how much information is posted as fact, when in fact, it is incorrect. The Internet has become a huge game of ‘BROKEN TELEPHONE LINE’ on which factual information quickly becomes outdated, twisted, misquoted, misunderstood and worst of all, reported as the God’s honest truth. Case in point is the question the students have asked. During Mr. Lincoln’s political career, he participated in many photo sessions as well as sittings for life paintings and even two life masks. The three photos presented at the start of this article are the ones most claimed by sources to be the last photo taken of the President. A quick search on Google helps to prove this point. I found these claims on websites, in books and even in auctions for pictures being sold on ebay. There can only be ‘one last photo’ of Mr. Lincoln taken while he was alive. I say ‘alive’ because there is one authenticated photo in existence of the slain President in his coffin in NYC but that is a different story entirely. To start with, let me clarify why there is so much confusion over this issue. Basically, the pictures above were taken at two different photo sessions in 1865. One was an impromptu session with photographer Henry F. Warren on the south balcony of the White House on March 6, 1865, just two days after Lincoln’s 2nd inauguration. In that session, Mr. Warren took three pictures of the President. The other was a formal portrait sitting with photographer Alexander Gardner. At that session, Gardner took a total of five photographs. The date of this session is where the confusion exists. Originally, most Lincoln scholars accepted a date of Monday, April 10, 1865 as the day the sitting took place. Several books published in the 1960s by well-respected Lincoln authors agreed with this date. April 10 meant that these photos were taken just days before Lincoln’s assassination on Friday, April 14. But a few years ago, new evidence was found by Mr. Harold Holzer, an eminent Lincoln scholar from the Metropolitan Museum of Art in New York. The evidence indicated that the date of April 10 was not correct and was more likely Sunday, February 05, 1865 instead. This being the case, the Warren photo suddenly became the last known one of Lincoln alive and to this day, it is still considered so. I have corresponded with Mr. Holzer on numerous occasions and so I wrote to him to ask about this information. He wrote me a nice email in response and included some specifics about the circumstances surrounding his discovery. Before continuing, I want to thank Mr. Holzer for his generousity in sending me this information. I know he has just released a new book and has begun an extensive schedule of touring dates and speaking engagements. Please see the end of this article for more on Mr. Holzer’s book and his personal appearance schedule. 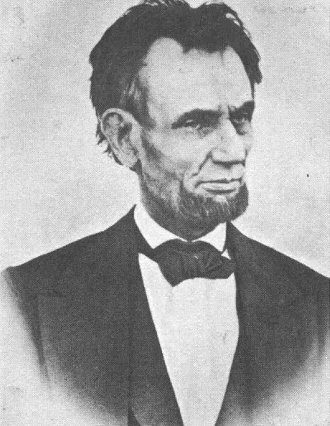 Below is a description of the two photo sessions from an article written by James J. Nance for the February 2008 issue of Kentucky Monthly Magazine entitled “Lincoln’s Last Portrait”. Nance credits references from the book “Lincoln in Photographs” by Lloyd Ostendorf and Charles Hamilton, and describes both the Warren and Gardner sessions. UPDATE: March 10, 2009: The Henry F. Warren section of this article, which was based on the Ostendorf and Hamilton photographs may not be 100% correct. I have inserted notes in red where differences of opinions between Lincoln experts vary. Also, a new Warren photo has just become public which may show the President in front of the White House. Although this article does not cover that photograph, I have included it, and a close up, to help put it in context with the rest of the article. Since the Warren photo is considered the last known one of Lincoln alive, I’ll cover that one first. Then I’ll cover the Gardner session which took place about one month earlier. As well, I have included the information on the Mathew Wilson painting that helped to verify the real date of the Gardner sessions. “The final Lincoln photographs were taken during his inauguration in early March 1865. In addition to a number of photographs of candid crowd scenes containing the president taken on March 4th, there were three notable photographs taken by Henry F. Warren on March 6th on the balcony of the White House. President Lincoln granted Mr. Warren’s request for a brief impromptu photo session on the White House balcony. Lincoln carried a chair out himself. Perhaps Lincoln believed that some photographic record of his inaugural was in order and Mr. Warren was at the right place at the right time. The first photo was a standing shot, which is noted in Warren’s papers, although the negative and print have never been seen. The remaining two were quick photographs of the chest and head of a seated Lincoln. Both of these photographs, O-112 and O-113, the last taken of Lincoln when alive, show him looking haunted and even more emaciated and haggard than during his last portrait O-116 from the session a month before on February 5th. Much of his visible exhaustion was surely due to the hectic activities surrounding his inaugural. However his more advanced weight loss and deteriorating physical condition is evident. The war was still not over and the final details must have weighed heavily on Lincoln. Although these two Warren photos were posed, they could hardly be called a formal portrait. They are fascinating because of their spontaneity and how well they reveal the tension of the moment. They are also very sad images and are not the way most people wish to remember Abraham Lincoln”. UPDATE: March 10, 2009: The debate about the Warren photo session concerns how many photos were actually taken that day. The story above claims three. Other’s claim two or even one (the one shown above). I have only ever seen just the one original myself. However there is a ‘second’ one, which is a retouched version of same photograph. If both of these photos are from the same original, then the story about two or three photos taken that day may be incorrect. As is often the case in history, conflicting information can often make it difficult to verify the ‘real story’. Regardless of the version you choose to believe, the Warren photo shown above is still considered the last known photo of Lincoln taken while he was alive. The new photograph made public this week by the current owner Keya Morgan was taken by Henry Warren on March 6, 1865 (the same day as the Lincoln photo above). It is a shot of the White House but when zoomed in on, a tall man with beard appears. When measured in scale against the height of known structures in the picture, the figure is about 6′-4″, the same height as Lincoln. Experts are excited over the find but ‘cautiously optomistic’ about it actually being Lincoln in the photo. If this photo does contain an image of Abraham Lincoln, and it was taken AFTER the photo above, then this would become the LAST KNOWN PHOTO OF ABRAHAM LINCOLN ALIVE. The photograph was in a family photo album belonging to Ulysses S. Grant VI, the great-great grandson of President Grant. On the back of the photo is Henry F. Warren’s seal and a government tax stamp. A written inscription reads “Lincoln in front of the White House”. The close up reveals a tall bearded man purported to be Abraham Lincoln. Experts are 'cautiously optomistic' about its validity. If this is Abraham Lincoln, it could be the last image taken of him while alive. Courtesy of Associated Press. I received an email from another Lincoln expert, Professor Ronald Rietveld, Emeritus Professor of History at California State University in Fullerton, California. Professor Rietveld is well known in Lincoln circles as the person who, at age 14, discovered the only known photograph of Abraham Lincoln in death. With regards to the Warren photo, I was surprised to learn that Professor Rietveld owns an original copy. Here is his response to my inquiry about the Warren and Gardner photos. 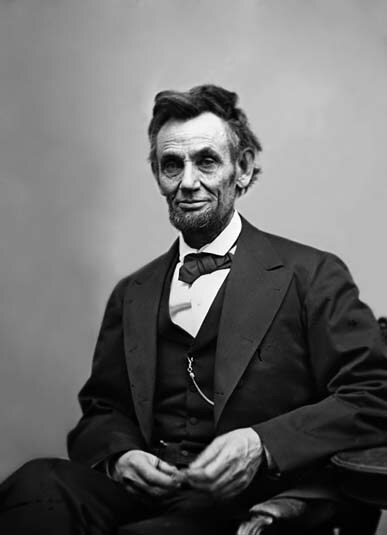 Your impression that the last known photograph of Lincoln in life was taken by Henry F. Warren on Monday, March 6, 1865–is correct! Indeed, it was taken late afternoon on the south balcony of the White House. And I possess an original copy of that photo which was given to me by Bert Sheldon, a secret service agent at the Franklin D. Roosevelt White House. I think I was about 17 when he gave it to me in Washington, D.C. The other two photos which you attached were taken at Alexander Gardner’s Gallery in Washington, DC on Sunday, February 5, 1865. The last formal pose which Gardner took was a close up. However, the glass plate cracked, and after a single print was made, the glass negative broke completely and Gardner threw the broken pieces away. I do not know when they began giving the date of April 10, 1865 for Gardner’s photos. But the Kunhardts in Twenty Days  missdate the photograph on pages 10-11 of their book. However, the very last photograph taken of the president, as I think you are aware, is the single print of the dead president lying in state in New York City Hall, April 24, 1865, which I discovered in the Nicolay-Hay Papers at the Illinois State Historical Library, Springfield, Illinois on July 20, 1952 at 14. I hope this is of some help. — Ron Rietveld”. In an article written by Linda Merrill called Abraham Lincoln, February 5, 1865 on http://picturingamerica.neh.gov a great description of the Gardner/Lincoln session is presented. “Gardner’s surprisingly candid photographs have proven more enduring, even though they were not originally intended to stand alone as works of art. This half-length portrait of Lincoln (above) is one of the finest from that February studio session. The president sits comfortably in a sturdy chair, his left elbow resting on its arm, his right on his own slightly elevated knee. There is nothing in this photograph to indicate Lincoln’s exalted position: we might just as well be looking at a humble country doctor. His clothing appears plain (though not unfashionable) and his loosely knotted bowtie has been left slightly askew. By this point in his public life, the president had sat for dozens of photographs, and he would have been mindful of the need to hold perfectly still during the several minutes it took to make an exposure. In this print, Lincoln’s eyes look steadily toward the camera but his hands fiddle impatiently with his eyeglasses and pencil as if to remind the photographer that he had more important things to do. What draws and holds our attention is Lincoln’s expression, which the poet Walt Whitman described as “a deep latent sadness.” At the time this picture was taken, Lincoln had weathered the worst of the war and almost succeeded in his fight to preserve the Union, yet he was painfully aware how much that cause had cost the nation. Lincoln appears much older than his fifty-five years, and Gardner did nothing to flatter the president’s haggard, careworn features. The photographer may even have exaggerated them, for the turn of Lincoln’s head leaves one side of his face slightly in shadow, making his right eye and cheek appear hollow and cadaverous. Before this session ended, Gardner asked the president for one last pose. He moved his camera closer and took a photograph of Lincoln’s head, shoulders, and chest. Mysteriously the glass plate negative cracked. 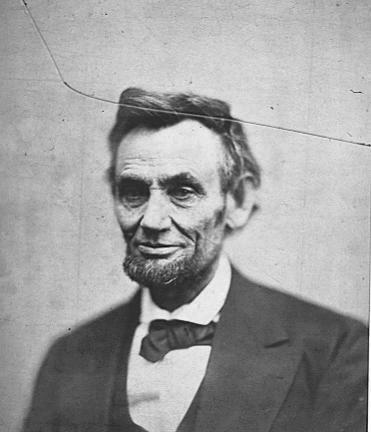 Gardner carefully took it to his dark room and was able to make one print, with an ominous crack across Lincoln’s face, before it broke completely and was discarded. This print, known as O-118, still exists to this day. Over the years many people have associated this crack with a symbolic foretelling of the assassin’s bullet that awaited Lincoln 10 weeks later”. February 5, 1865 – Alexander Gardner photo of Abraham Lincoln (exposure #5) #O-118. This would have been the last known photo of Lincoln had Matthew Henry Wilson’s diary not confirmed that the Gardner photo session took place in February rather than on April 10 as had been previously believed. 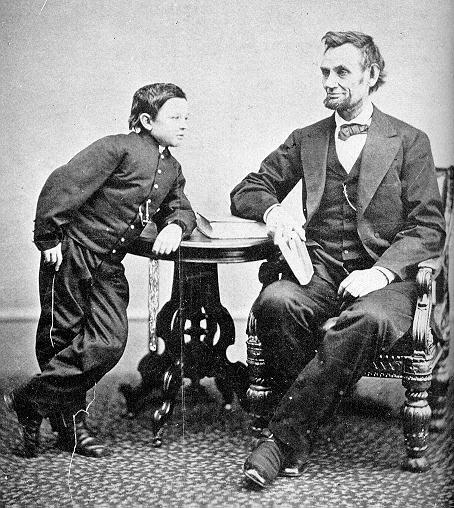 But at the time of the session, Lincoln could spare so little time to pose, so the artist needed recent photographs to work from. The pictures served their purpose, but the resulting painting—a traditional, formal, bust-length portrait in an oval format—is not particularly distinguished and hardly remembered today. After Lincoln’s assassination, a Boston publishing firm exploited the nation’s grief by producing prints of the portrait Matthew Wilson had based on Gardner’s photographs. Gardner’s own publisher countered a few days later by offering photographs from the February studio session. They were advertised as the products of “Mr. Lincoln’s last sitting.” That unsupported (and until recently, unquestioned) claim gave rise to the tradition that Gardner’s portraits had been taken just four days before Lincoln’s death, investing them with a special aura of martyrdom. We now know that these were not in fact the last portraits of Abraham Lincoln. Even though Gardner’s picture does not belong to the president’s final days, it records his weary and worried countenance during the last long weeks of the war, when the surrender at Appomattox was still some months away. 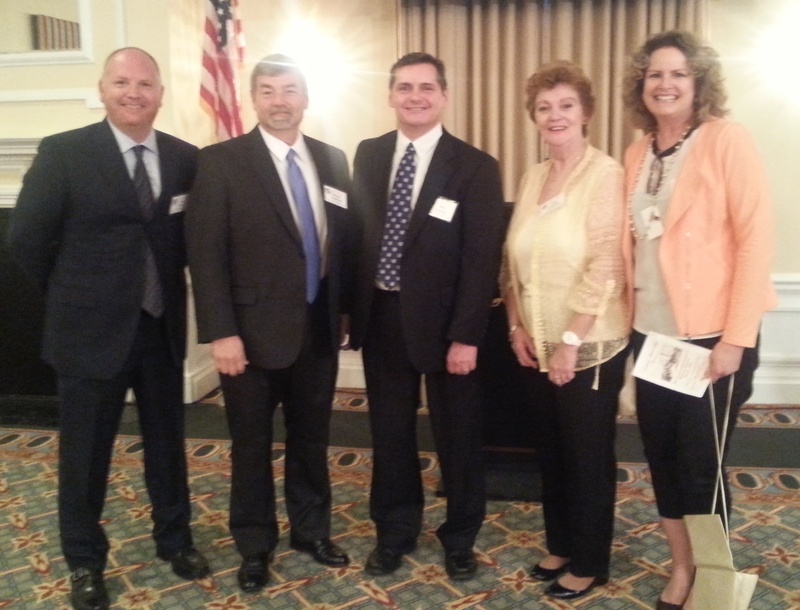 I want to thank James J. Nance for the wonderful article posted here. Mr. Nance is also a talented artist and has produced a digital colorized version of O-116 which he sells online. I loved it so much, I bought one myself. Tall man by gate pedestal thought to be Abraham Lincoln. If true, this could be the last known photograph of Lincoln taken while alive.